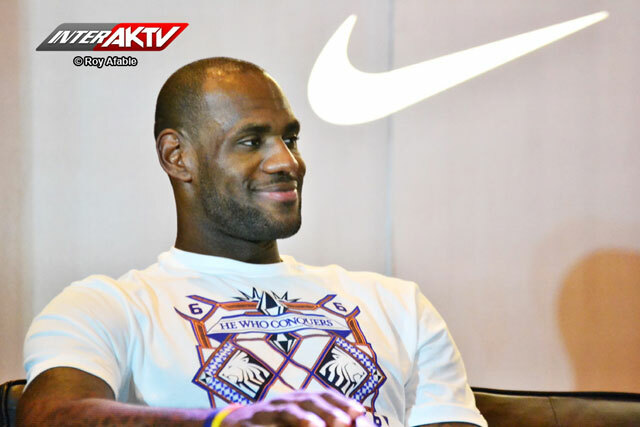 LeBron James recent came to Manila, Philippines, and spoke to Boom Gonzales during a press conference at the Shangri-La Hotel in Makati. The visit was a part of his "Nike Witness History" tour. "This is very overwhelming, to see all these people excited. I’m looking forward to what today brings," James said. "I' can't believe it's my first time here. I understand how huge basketball here. It's definitely not going to be my last." During his visit, he made a stop at the Nike Park store in Taguig, and coached a basketball game at the Mall of Asia Arena where he meet thousands of fans. He also held a skills challenge, where some local Nike Basketball endorsers participated. James, who is just 28-year old, is a nine-time NBA All-Star, a four-time NBA MVP, and has two NBA championship rings.